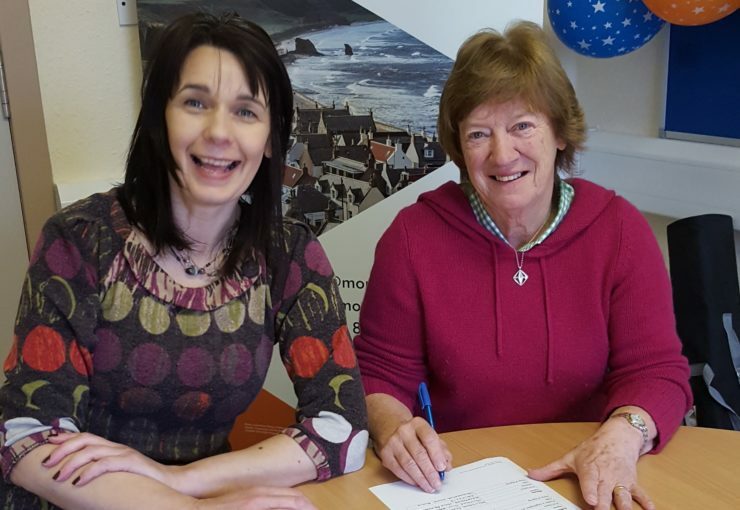 Photo: Edna Cameron of The Moray Society (right) signs to accept their offer of funding. With her is Moray LEADER Development Officer Michelle Gillibrand. The first successful projects to be awarded funding under the Moray LEADER Programme have been named, amounting to an investment of more than half a million pounds in the economic and community development of Moray. The decision to fund the projects was made by the Moray LEADER Local Action Group a partnership made up of representatives of the public, private and third sectors and independent members from across Moray. The funding awards include Macbeth-themed holiday lodges, an exciting new social enterprise hub, a major event highlighting the issue of poverty in Moray and renovation work on one of Elgin’s top attractions. Funding awarded comes to a total of £519,379. Karen Sutherland from Brodie has been awarded funding to improve Macbeth’s Hillock - the site where Shakespeare’s Macbeth is said to have met the three witches - from a currently undervalued tourist destination to a focal point in the promotion of Moray as the home of Macbeth. LEADER will part-fund the development of five mini lodges for holiday accommodation, which will have a quirky uneven appearance so as to resemble witch huts, and information boards which will tell the story of Macbeth, the witches and the Real Macbeth, as well as giving tourists information about other sites in the area relevant to this time. The award will cover 70% of the total eligible project costs. Ekopia Resource Exchange Limited of Findhorn have been awarded funding to develop and build a Social Enterprise Hub at Findhorn Ecovillage, the aim of which is to provide a collaborative, supportive and affordable working space for innovative social enterprises in the Moray area. The hub will provide offices, workshops, spaces for food production/craft activities and facilities such as hot-desking, along with access to social networks, peer support, information and expertise in an environment which will facilitate collaboration, innovation and cross-pollination, thereby supporting Social Enterprises to develop their enterprises and increase the impact of their work. Moray Foodbank has been awarded funding to run a conference on poverty in Moray, working with members of the Fairer Moray Forum, a strategic group consisting of representatives from third sector organisations, NHS Grampian, Parliament, and The Moray Council. The conference will be a free event with a variety of speakers covering different aspects of poverty. Professionals attending the event will gain knowledge, create new links and ultimately be better placed to support their clients and improve the lives of those most in need in Moray. The Moray Society has been awarded funding for renovation work on Elgin Museum that will address key issues which will significantly improve the condition of the building, protecting its collections housed within as well as prolonging its lifespan allowing future generations to benefit from this significant and much loved resource. The physical work will be an addition to the architectural appearance and the overall ambiance of the historic High Street and the Museum building will be a stopping point for visitors who wish to study the growth of the burgh and the development of architectural styles through time since the award of the burgh charter by King David I in 1136. The award will cover 25% of the total eligible project costs. “The Moray LEADER LAG is delighted to have been able to agree these applications. Members are pleased at the variation in the applications which obviously meant lengthy deliberations by the LAG before they could be agreed. It also shows that the Local Development Strategy, which the LAG must work within, allows for a variety of successful applications”.